In poems often with long lines, which border on prose at times, with a couple prose poems for good measure, and one rhyming sonnet, these 20 poems work from childhood reminiscences, through early adulthood, with reflections on loss and disconnections, idealism and hope, desire and knowledge. Memories of childhood where “under blanket, a green glow emits…/the child following each word she reads” foreshadows the book itself, a fascination with stories that simultaneously mirror life at the nose tip and raise the humdrum to beautiful ideals. And the practical truth that those same stars are still there for us, if we look. Far too often the beauty we know is shadowed by our own nearsightedness. The long lines remind me somewhat of Campbell McGrath’s poems. Goldstein shares McGrath’s talent for elevating commonplace experiences into thoughtful encounters readers will carry with them. Goldstein edits Moon Pigeon Press to which I subscribe, and I appreciated reading her own poems after reading a year’s worth of poems she chose for publication. The book itself is well put together. I have recently purchased titles from several small presses, and based on this volume, Dancing Girl Press & Studio ranks just above the middle in terms of print and layout quality. With two staples, the cover is a durable paper that feels good in the hands, with a teal wave pattern that is reminiscent of the Ruth Robbins woodcuts from the 1970s edition of the Wizard of Earthsea books. 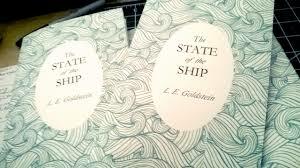 While a couple of Goldstein’s lines almost run off the page and the lines between the wallpaper cover image are visible, if not obvious, the book is well produced, well written, and well worth the $7 price tag http://dulcetshop.myshopify.com/products/the-state-of-the-ship-l-e-goldstein.